Why does Bolter say the alphabet, a symbol system that represents spoken language, is artificial or more artificial than computer generated visuals? In fact, Hayles refers to our traditional text form as “natural language” (Hayles, 2003) as it relates most closely to our spoken word. Both are pathways to communication and both may be open to variety in interpretation. Certainly, when possible, text is balanced with images in traditional books. Bolter rightly points out that Medieval Manuscripts, ancient Greek and Chinese art demonstrated an intertwining of text and visual but goes on to suggest that the visual became subjugated to text with the advent of printing. He says that “printing has placed the word effectively in control of the image.” (Bolter, 2001) It seems more likely that the limits of technology are the basis for this. Bolter claims that the “ideal of the printed book was and is a sequence of pages containing ordered lines of alphabetic text.” (Bolter 2001) For practical reasons, printed text has been predominantly black and white with limited illustrations and not necessarily because text is seen as superior. 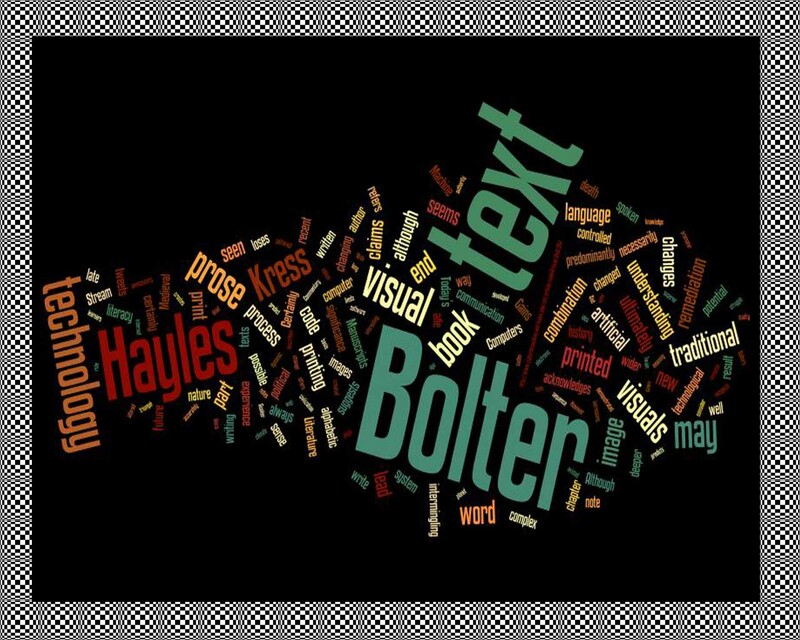 Bolter acknowledges that technology plays a role but insists that the printing press was a promoter of “homogeneity and reinforcing the sense of the author as authority,”(Bolter, 2001) and that text itself has been waging a struggle against the visual. Returning to Kress’s idea that we consider the wider and more complex context, it seems that this apparent conflict was due to the combined forces of the limits of technology, the political climate and the dawn of the industrial revolution. The English language is always evolving, the endless texts and tweets, wikis and blogs that are currently being developed, although not universally of a high literary quality, certainly do not spell the death of prose. Today’s technology users are benefiting from the quickness and ease of textual exchange used in combination with visuals as needed and possible. Today’s learners have tools that can allow a layered experience that has the potential to lead to a deeper understanding of both text and visuals. These changes do not demand the end of prose or of text, or as Bolter suggests the triumph of the visual, but are steps along the pathway of communication that we are creating, as we strive for understanding of the complex interactions of ourselves as humans, our planet and technology.